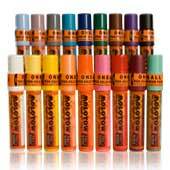 One4All Acryl Mix-Color Striptube Refill 5-SetThese are 10ml tubes for the quick and easy refill or for mixing your own shades. 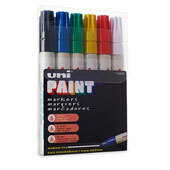 Original ONE4ALL quality in resealable single tubes in 5-base colors. 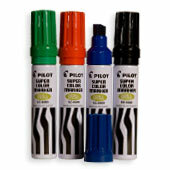 The single striptubes can become applicators by attaching a 10mm DRIPSTICK tip. 10mm Replacement Nib Single 10mm Replacement Nib 5 Pack Colors: 1 x 013 traffic red 1 x 006 zinc yellow 1 x 204 true blue 1 x 160 signal white 1 x 180 signal black ONE4ALL is the most universal paint on the market. Whether it's marker, brush, stamp or airbrush this paint works with every application tool and on a wide range of surfaces. 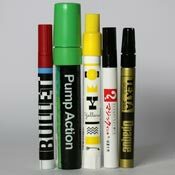 We have used it on wood, metal, leather, plastics, toys, mobiles, skateboards, canvas, wall and many more with great success! Not just ink...real thick paint! ONE4ALL is a highly pigmented, ready to use acrylic-based hybrid-paint, completely solvent-free, can be diluted with water (for translucent effects) or acetone (for permanence on fatty surfaces), high-covering, quick-drying and has a smooth matte finish. It is 100% UV- and weather-resistant and therefore suitable for indoor and outdoor applications. All colors are intermixable. 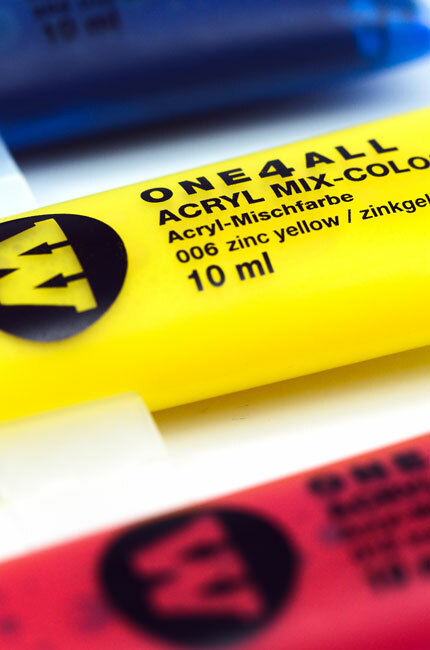 When using One4All with additional products for the first time, we advise an initial small patch test. These are 10ml tubes for the quick and easy refill or for mixing your own shades. Original ONE4ALL quality in resealable single tubes in 5-base colors. 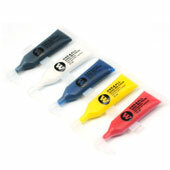 The single striptubes can become applicators by attaching a 10mm DRIPSTICK tip. ONE4ALL is the most universal paint on the market. Whether it's marker, brush, stamp or airbrush this paint works with every application tool and on a wide range of surfaces. We have used it on wood, metal, leather, plastics, toys, mobiles, skateboards, canvas, wall and many more with great success! Not just ink...real thick paint! ONE4ALL is a highly pigmented, ready to use acrylic-based hybrid-paint, completely solvent-free, can be diluted with water (for translucent effects) or acetone (for permanence on fatty surfaces), high-covering, quick-drying and has a smooth matte finish. It is 100% UV- and weather-resistant and therefore suitable for indoor and outdoor applications. All colors are intermixable. When using One4All with additional products for the first time, we advise an initial small patch test. I got one of these on a whim and was glad I did cause it saved a project when I ran out of some basic primary colors, not to mention it's nice having an extra black or white refill or two for my 127/227s. Molotow High Solid hybrid acrylic ink is probably my favorite ink next to poscas for canvases and artwork. I also saw somewhere you could put a nib on these and make them 5ml mops. Molotow comes through with the goods on these strip refills. What's not to like? 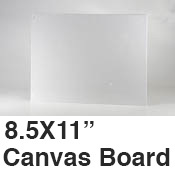 This product was added to our catalog on Thursday April 05, 2012.